In their first season in the United States Football League, the Houston Gamblers had developed into an exciting offensive team with their prolific passing attack led by rookie QB Jim Kelly. However, Head Coach Jack Pardee’s team could also run the ball, and on June 3, 1984 it was the ground game that achieved headlines. 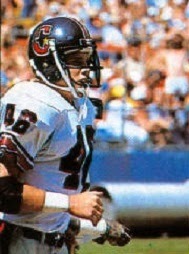 Todd Fowler (pictured above) had been a tight end in college and was converted to running back by the Gamblers during the preseason, although he was viewed more as a blocking back at that time. His value as a runner rose once Sam Harrell, who had set a USFL single-game record with 200 yards earlier in the season, went on injured reserve, and he had already compiled three hundred-yard rushing performances. Houston had won three straight games and was atop the USFL’s Central Division with a 9-5 record prior to traveling to Denver to take on the Gold. Denver, on the other hand, slumped badly after getting off to a 7-1 start and was now 8-6 after snapping a five-game losing streak the previous week. Coached by Craig Morton, the Gold suffered from instability at quarterback and was giving up too many yards on defense. Still, they remained in first place in the mediocre Pacific Division and were battling to maintain that position. There was a typically good turnout of 50,057 at Mile High Stadium. To blunt Houston’s passing attack the Gold started no linemen, but instead five linebackers and six defensive backs. The overcompensation left them vulnerable to running plays. Late in the first quarter, Todd Fowler ran seven yards for a touchdown for the game’s first score, with Toni Fritsch adding the extra point. Fowler set up Houston’s next score in the second quarter with a 53-yard burst up the middle, and that possession resulted in a 36-yard Toni Fritsch field goal that made the tally 10-0. Craig Penrose came in at quarterback in the second quarter, replacing Fred Mortensen, who had failed to connect on any of his six passes. The Gold narrowed the Houston lead with a 56-yard drive that was kept alive when, forced to punt at one point, the Gamblers roughed the kicker. Penrose finished off the series by passing to RB Harry Sydney for a 28-yard TD. Brian Speelman made it a three-point game with his extra point. That was the high water mark for Denver. The Gamblers proceeded to score 26 unanswered points to take a commanding lead. They first extended their margin when Jim Kelly threw to WR Ricky Sanders for an 18-yard touchdown to complete an 86-yard series. Houston topped off the first half scoring with a 43-yard field goal by Fritsch on the last play before halftime and the Gamblers took a 20-7 lead into the locker room. Fritsch kicked a 49-yard field goal in an otherwise-scoreless third quarter in which the Houston defense continued to stymie the home team. On the first play of the fourth quarter, Fowler took a pitchout and broke away for a 46-yard touchdown and, while the extra point try was blocked, Houston was well in front by a score of 29-7. The Gamblers tallied once more, on a Kelly pass to WR Scott McGhee that covered 23 yards. Denver managed to put two TDs on the board before it was over, with the Gold’s third quarterback of the day, Ken Hobart, connecting with WR Elmer Bailey from 12 yards out and then RB Bo Matthews running one yard for a touchdown. The two-point conversion after the second TD was unsuccessful, but it had no effect on the outcome as the Gamblers came away with a comfortable 36-20 win. Houston dominated in total yards (465 to 279) and first downs (23 to 15), and the yardage total showed balance with 244 gained on the ground and 221 through the air. The Gold turned the ball over four times, to none by the Gamblers, and Houston also accounted for four sacks, to two by Denver. There were many penalties, with Houston leading in that category as well, drawing 10 flags at a cost of 70 yards to 8 penalties and 74 yards on the Gold. Todd Fowler broke teammate Sam Harrell’s record by rushing for 208 yards on 21 carries that included two TDs. Jim Kelly (pictured below) completed 20 of 31 passes for 216 yards and two touchdowns, with none intercepted. Ricky Sanders led the receivers with 8 catches for 91 yards. Toni Fritsch kicked three field goals, tying the league record of 12 straight, but a fourth attempt late in the contest was blocked to end the streak. For the Gold, Craig Penrose had little more luck than Fred Mortensen with his passing, succeeding on just five of 17 throws for 61 yards and a TD while giving up two interceptions. Ken Hobart went 7-of-11 for 156 yards and a touchdown as well as an interception. Three Denver players caught two passes apiece, with Elmer Bailey gaining 79 yards on his pair that included a score. RB Vincent White paced the ground game with 28 yards on 6 attempts and Ken Hobart was right behind with his 25 yards on three carries. “My offensive line knocked out some big holes in the defense, and all the credit should go to them,” said Todd Fowler regarding his record-setting performance. The Gamblers went on to win the Central Division with a 13-5 record, although they were beaten in their First Round playoff game by the Arizona Wranglers. Denver ultimately slid to a disappointing 9-9 tally, placing third in the Pacific Division. Todd Fowler ended up rushing for 1003 yards on 170 carries with an impressive 5.9-yard average while scoring 11 touchdowns. 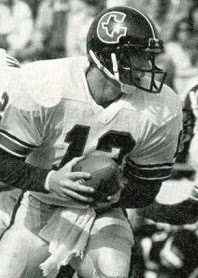 Jim Kelly’s two touchdown passes put him at 36 for the season (tying the then-existing NFL record) on his way to 44 as he led the USFL in most major passing categories and received league MVP honors.